I don’t know about you, but I’m getting older. It has even started to show: grey hair, thinner skin, “fine lines,” more muscle pains that take longer to get better. But while more of us are older than at any other time in human history, we are in our infancy in understanding aging. In the mid-1990s, I attended a talk by Leonard Hayflick, author of How and Why We Age (1994). Work conducted over the 30 years before Hayflick’s book had established some of the mechanisms of aging. But before that, we had little idea why the body aged. Hayflick is a folksy, easygoing talker, who walked a group of non-specialists through how cells – and we – age. At one point, he picked up a fireplace poker to point at his projected slides. He said cheery things like there’s no reason for us to be around after we reproduce and raise our children. That is, from an evolutionary point of view. Hayflick explained that the reason we get old is that our cells get old. Here’s why: every time they divide, cells lose a few of the little repeated bits of DNA at the ends of the chromosomes. This is not good, because that DNA might have some genetic code that runs something in our body. So the chromosomes have caps at each end, called telomeres, that don’t do any protein coding and that shorten after each division. As well, telomeres prevent chromosomes from joining or rearranging, which could result in abnormal cells, which could lead to cancer. Eventually, those telomeres are all used up, at which point the cell stops dividing. This was one of Hayflick’s breakthroughs, and the finite number of divisions is called the “Hayflick limit.” At that point, the cell may enter the cell’s equivalent of old age (senescence), in which does not divide and barely functions, or self-destruct (apoptosis). As various cells stop growing or die, we age, losing functions of our body, until one day some vital function stops altogether. It’s a good thing cells get old and die, because it turns out the only type of cells that don’t age and die are cancer cells. These cells are immortal; their telomeres don’t shorten; they keep on going. That’s why the cells taken from the cervical cancer suffered by Henrietta Lacks, an African-American woman, in 1951 are still alive today and used extensively in scientific research (HeLa cells). It’s ironic that the search for eternal life is ultimately self-defeating: the only immortality to be found is in cancer, which can end your life. So stop complaining about getting old, because the only biological alternative is worse. But the relationship between aging and cancer turns out to be more complicated than that. As a scientific editor, I work with a number of authors on papers for submission to journals (among other things I do). One of the authors I work with, Richard Richardson of AECL and McGill University, studies cancer and aging. You will notice that the cancer incidence rates also begin to fall after about age 80. One such mechanism is a gene called TP53, which other authors have called the “guardian of the genome.” It is involved in some of these end-of-life processes for cells, ensuring that cells go into either senescence or apoptosis once their telomeres are used up. In an article published in Cell Cycle (doi: 10.4161/cc.25494) in 2013, Richardson looked at TP53’s role in aging and cancer. TP53 is a gene that often mutates as we get older. Mutations can stop it from doing its job in keeping old and abnormal cells from becoming cancerous. As a result, these mutations have a significant role in cancer, and can make a tumour malignant or invasive. As well, the mutations are implicated in cancer affecting a wide range of organs and cells. Richardson looked at large global databases of cancer tumours to tease out the relationship between TP53 mutations in these tumours and patient age. One theory of why cancer rises quickly with aging is “genomic instability” – problems with the entire genetic code that develop as we age. Experiments have shown that TP53 mutations may be a cause of this genomic instability. Based on his study findings, Richardson estimates about one-quarter of the aging-related rise in cancer is probably due to mutations in this gene. So, aging is what cells do normally, and the only cells that resist aging are cancer cells. But aging also raises the chance of cancer if the TP53 gene is no longer working the way it is supposed to. That’s not all that is happening as we age. Cells are growing and dying, and our organs are changing as a result. Richardson’s research shows that some of these processes actually start early in adulthood, and may hold clues to cancer and age-related changes. First, cells in the body are replaced on a cycle, and the “turnover” time to replace cells varies widely, depending on the type of cells. Some cells with a fast turnover (but, mysteriously, not all) are more prone to cancer. Epithelial cells, for example, have a far higher turnover and cancer incidence than any other type of cells. These cells make up our skin and the tissues lining the inside cavities of our bodies, as well as many glands. We also know that most of the tissues and organs of the body lose mass as we age. We may not realize that they are getting smaller because the mass lost is “functional” mass of the organ tissue, which may be converted to fat (in case you hadn’t noticed) or fibrous tissue. 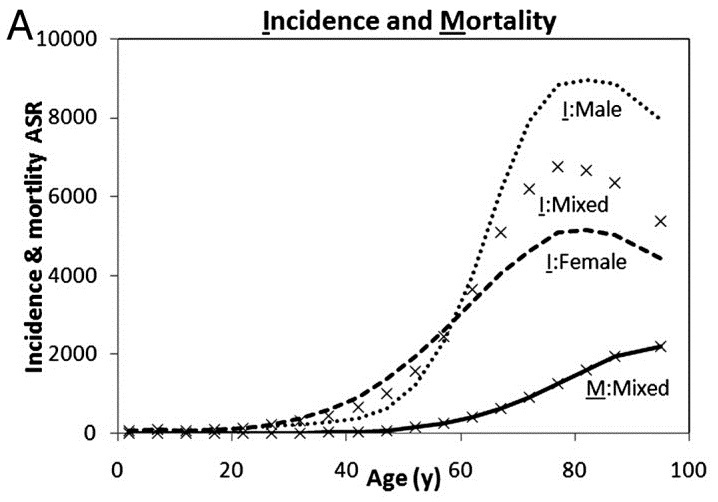 In a paper published in Experimental Gerontology (doi: 10.1016/j.exger.2014.03.015), Richardson and his colleagues found that the tissues and organs start to lose mass when their owners are 12 to 50 years of age, depending on the organ, with most organs starting to decline in a person’s 30s. As well, in many organs the mass loss accelerates as we age, although in some organs this is not a strong or consistent effect. They also showed that cell turnover time and this mass loss are related. As we age, the cells enter their old-age state or self-destruct, there are fewer and fewer replacement cells, and the organ or tissue shrinks. This happens earlier in cells that turn over faster because of the Hayflick limit – the number of divisions that can happen before the cells stop dividing. There are other factors that could lead to mass loss, too, so it’s not entirely straightforward. So far we’ve tied together cell turnover, mass loss, our old friend Leonard Hayflick, and aging. Now cancer comes in. Prevailing theories of aging and death hold that we lose overall fitness (all our bodily functions, not just why I can’t do the tougher exercises at the gym anymore) and generally decline with advancing age for an evolutionary reason. Evolution has selected humans who are strong and bear and care for children when they are young, but the trade-off is that we age and decline. Basically, these theories say, when humans were evolving we never made it to old age because of accidents and diseases, so the fact that our bodies started breaking down when we were older (through DNA damage as well as “wear and tear”) wasn’t part of the equation. (Both Richardson and I dispute this view: there is evidence that even early Homo sapiens achieved old age.) But Richardson asks, if this theory were true, then why would our organs start to shrink when we’re young adults? It seems like there’s a reason why the aging process starts soon after we start to have children. Richardson’s research seems to contradict the longstanding theory that evolution just turned a blind eye to aging. The mass loss seen even in young adults is linked to cell turnover, which leads cells to exhaust their divisions and attain the old-age state (senescence). If more cells are becoming senescent, and fewer are growing, this prevents cancer. In fact, Richardson theorizes, this mechanism may have evolved to prevent cancer in young people in their prime reproductive (and just plain productive) years. If so, it has done a good job, as cancer rates in young people are low (see graph). Richardson thinks the patterns of cancer throughout the human lifecycle may also have to do with stem cells. Stem cells start the process to grow or replace tissues and organs. The stem cells produce progenitor cells, which can then “differentiate” into other types of cells, such as blood cells or bone cells, that are needed by the body. Stem cells can divide also into two stem cells (self-renewal). Throughout life, the stem cell capacity slowly diminishes. While the body is growing, there are plenty of stem cells to supply the huge demand for cells for development. Growth tails off in the 20s, but then the demand for new cells starts to increase again as existing cells enter the old-age state (senescence) or self-destruct (apoptosis) and need to be replaced. In particular, the need for new cells to replace damaged cells increases throughout life. At a certain point, the demand for cells starts to outstrip supply. This is when the tissues and organs shrink. However, Richardson believes that, in some people, this demand-to-supply ratio becomes very high, either because of extremely high demand for new cells or “exhaustion” of stem cells. In this condition, some of the stem cells may become precancerous, and lead to cancer after a lag of a few years. Richardson explored this hypothesis in a paper in Mechanisms in Ageing and Development (doi: 10.1016/j.mad.2014.06.001) by looking at age patterns and stem cell supply in relation to bone tumours; the demand-to-supply ratio fits the patterns seen in common ages when bone tumours are found. And that drop-off in cancer rates in people over 80? Telomere length and cell senescence stabilize in elderly people, which means that the rising demand-to-supply ratio for stem cells peaks and then declines. What I like about research – all research – is that it points us in a useful direction. For example, researchers have long wondered why women live longer than men, on average, and looked at estrogen, immune factors, oxygen usage and so on. Well, it turns out women’s telomeres are about 9% longer than men’s (according to evidence from peripheral blood cells), which is probably an important factor. Understanding the relationship between aging and cancer may one day open doors in preventing and treating cancer. It is basic research like this that leads to the big health breakthroughs. But that can take time. I find that understanding how our bodies work can also help us accept the current reality of our human lives.